Planning and dispatching of one of our certified technicians. Digital inspection with a Pocket PC. Data synchronization between the Pocket PC and our database. 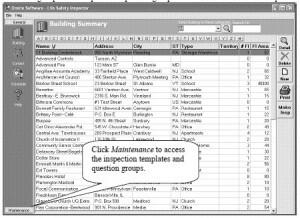 See an example of a Report_wet pipe system or a Report_fire pump. GLB makes sure to explain the deficiencies of your system if any. Faults are described and photos taken to support deficiency evidences. These are included in the inspection reports to offer visual support of deficiencies, allowing to reduce communication difficulties between the parties involved. Our fire system testing in Quebec and Canada will suit your needs. You can therefore better assess the scale of the investment to maintain proper protection of your assets and people. NOTE : Our inspection system ensures the occupant security. We are expert in the inspection of senior residences as well.